Wheat berries make a delicious salad. Wheat berries, also known as wheatberries, are not berries at all, but the whole kernel from a wheat plant. They are delicious and packed with fiber, protein, and other healthy elements. Wheat berries can be enjoyed in a number of ways, and make an excellent addition to any diet. Wheat berries are hard kernels or seeds of wheat. They are available to buy at many fresh food markets, health food stores, and grocery stores, and can often be purchased directly from local farms. The seeds are generally cleaned before they are sold, and sometimes frozen to kill any organisms harbored inside. They are also low in fat. Wheat berries are very high in gluten, however, making them unsuitable for gluten-reduced or gluten-free diets. One of the most appealing aspects of wheat berries is their shelf life. These kernels can be stored, in a cool dry place inside an airtight container for up to ten years. Used as a base for salads, stir fry dishes, or casseroles. Cooked and served as a hearty breakfast cereal. Toasted and cracked, and added to breads. Sprouted and added to soups or salads, or added to bread and other baking. Cooked and added to soups and chili, or made into vegetarian meatloaf or burger patties. The flavor of cooked wheat berries is slightly nutty, and the texture is very chewy. White wheat can be used in traditional white bread products to add the nutrition of whole wheat, while keeping the appearance and texture of white breads. Cooking wheat berries is a very simple process, though it can be time consuming. Since the kernels are very hard, they require soaking prior to a lengthy cooking time. Here is a very basic way to cook them. Soak one cup of wheat berries in enough water to completely cover them, for about 12 hours. Drain the water used for soaking. In a large saucepan, combine wheat berries with 2 1/2 cups water. Over medium heat, bring to a boil. Reduce heat to simmer, cover, and cook wheat berries for one hour. Check for doneness, and continue cooking until desired consistency if needed. All of the water should be absorbed, and the kernels should be soft and easy to chew. You can also cook the kernels in a slow cooker, which requires more cooking time but eliminates soaking. Combine one cup wheat kernels and 2 1/2 cups water in a slow cooker. Cover with lid. Set temperature to low, and cook for 8-10 hours. Check for doneness at the 8-hour mark. If the wheat berries seem to be getting too dry, add a little more water as needed. Instead of water, cook the wheat seeds in fruit juice, broth, or add a touch of wine. Add garlic, diced onion, or fresh herbs during the last hour or so of cooking time. Add dried fruit, nuts, or other grains, along with a touch of cinnamon, for a filling breakfast meal. You can also add milk and brown sugar to individual bowls before serving. 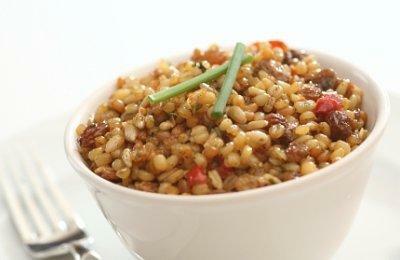 You can serve cooked wheat berries in place of brown rice or other grains. Doctor Grandma's - Lots of recipes, from chili to pilaf. Whether you eat them cooked, ground, toasted, cracked, or sprouted, wheat berries are a healthy and tasty addition to any diet.